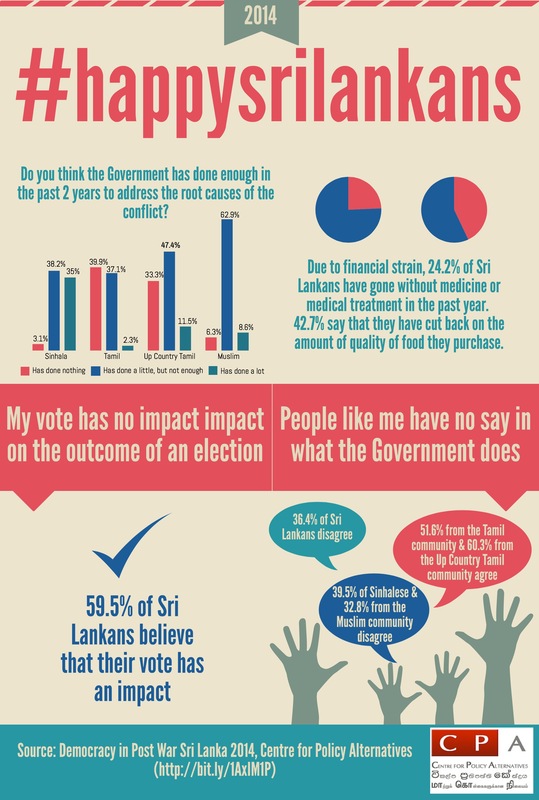 10 November 2014, Colombo, Sri Lanka: This is the first of a series of infographics that have been designed using the latest findings from the ‘Democracy in Post War Sri Lanka’ survey conducted by Social Indicator, the survey research unit of the Centre for Policy Alternatives. “Clearly, happiness in post-war Sri Lanka is unequally shared, and no greater insight into this can be found than looking at the silences, gaps and absences in these ‘Happy’ videos”. This is precisely what the latest findings from the democracy survey reveal. Priorities when it comes to development, impact of the cost of living on the household, freedom of expression and movement, satisfaction with reconciliation efforts, sense of empowerment as citizens of Sri Lanka vary by different ethnic communities and even by Provinces. Read the latest top line report in full here. For higher resolution infographic, click here.